Previously in band history: Albedo got together during the spring of 1997. Drummer Martin Robson and I were playing together in Shnaffel with Steve Campbell-Law and Gary Langridge when that band hit a rough patch. We’d recruited singer Alf Ellis who joined after auditions in February 1997. After gigs in March 1997, Gary and Steve left and we decided to change the name of the band as I was the only original Shnaffel member left. The three of us started writing together and new songs were quickly added to the selection of my Shnaffel songs that we decided to keep. In the meantime we were also looking for a bass player, but this proved trickier than expected, and it was not until late April that we auditioned Steve Williams. He was just the right person and he accepted the offer to join. Albedo in Tunbridge Wells. From L-R: Steve, Alf, Martin, Me. With the lineup complete, we began to define our sound and carried on writing to build a strong setlist. Albedo played a couple of low key pub gigs over the summer to test out the waters, and got a good reception. At the end of the summer we went into Granary Studio in Lamberhurst, Kent to record a demo. The tape featured – ‘It’s Only Love’, ‘Why?’, and two versions of ‘Lonely Me’. In the Autumn we started gigging seriously including a few at The Forum in Tunbridge Wells, at the Laurel Tree in Camden, London (now Brewdog) and other venues around Kent. Early 1998 saw us back in London after our demo had interested a couple of record companies, but unfortunately nothing came of this. 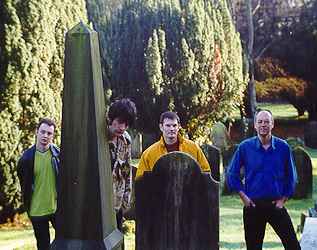 We recorded another demo in March 1998 featuring new songs ‘It’s Impossible’, ‘Slap Bang’ and ‘Alicia’ – all good crowd pleasers at our gigs. Around this time, ‘Why?’ from our first demo was included in a compliation CD of bands who had played in Camden. You can hear all our demos on Soundcloud. Unfortunately though it didn’t last and a bit of apathy crept into the band, and by the summer of 1998 we weren’t functioning properly together any more. I left in early September 1998 and that was it for the brief star that was Albedo. After many years of rehearsing and gigging I decided to have a rest from bands and to spend time on other aspects of my life. However, this was not quite the end of my public music career – see the 6 Dangerous Gangsters section for the next part.